Journey to Christmas festival is one of the merriest events in Moscow! RBTH presents a digest of the most delicious events in Russia coming up in December. Should you happen to be in the Russian capital this month, don’t miss the Journey to Christmas festival — one of the highlights of Moscow’s holiday season. From Dec. 16 to Jan. 15, 42 locations around the city will offer concerts, street theater performances and master classes as well as food stalls and booths with gift ideas for everyone on your list. Over 200 small chalet-style booths will offer vintage Christmas tree decorations, handicrafts, gourmet chocolates, gingerbread houses, candy apples and more. Products from 40 Russian regions and 15 countries will be available. At Manezhnaya Square, just in front of the Kremlin, a giant cheese market will open, featuring Swiss-style raclette cheese, cheese balls with cranberry jam, bruschettas with cheese, ricotta with blueberry jelly, chocolate cheese and an enormous variety of cheesecakes. Moscow restaurants are sponsoring 60 chalets, offering special holiday menus delicious culinary master classes: visitors will learn how to prepare alcohol-free gluhwein, kulebyaka with apple filling, honey sbiten with spices and uzvar made from dried fruit and that must-have of the New Year table — Olivier Salad. Kids can try to make dishes from their favorite fairytales: Fröken Bock’s vatrushkas or ancient Rus’ semolina porridge. Children can also take part in dance parties, relay races, a book fair and robotics classes. The chance to play the musical instruments of ancient Rus’ — hand-rattles and spoons — should appeal to both kids and adults! Every Russian knows that there can be no New Year without mandarins. Each Saturday in December, visitors to Sokolniki Park can take part in a special mandarin celebration from 2 p.m.- 4 p.m. There will be funny contests, and the winners will receive mandarins (and candy). Two robots in the form of Ded Moroz (the Russian Santa Claus) and Moydodyr (a character from a classic tale by Kornei Chukovsky) will award the prizes. Don’t miss the train! It leaves from Fountain square. 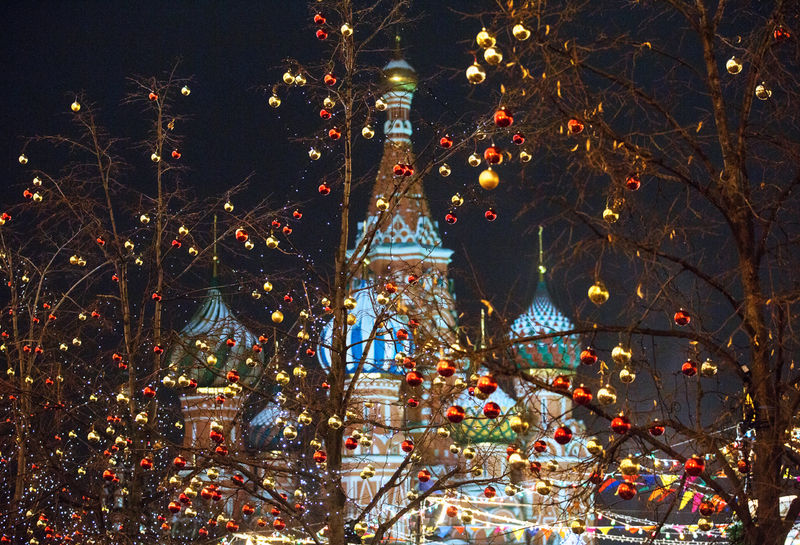 A classic Christmas Market will be set up on Red Square from December until the end of February. The festival features 45 booths offering traditional winter treats from across the globe: blini with sour cream, Tula gingerbread, herbal tea, Belgian waffles, roasted chestnuts and more. This is also the best place to shop for traditional Russian gifts. Samovars, matryoshkas, Orenburg and Pavlovskiy Posad shawls, Dymkovo toys and much more will be on sale. This market is a one-stop-shop: visitors can buy a Christmas tree, the decorations to put on it, and the gifts to put under it all in one place. Visitors will be entertained by dancers, musicians, magicians and even Ded Moroz with Snegurochka (the Snow Maiden).